The need for clean, pure, moisture-free air, gases, process liquids and solvents is critical for innumerable applications today. 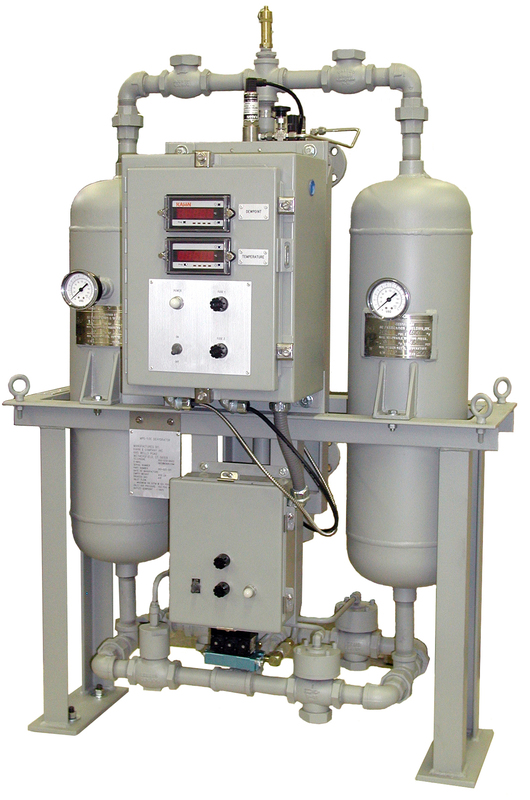 Kahn & Company has manufactured adsorptive dehydration and purification systems for over 50 years, and today specializes in providing highly efficient, reliable dehydration and purification systems for a wide range of demanding applications. Kahn offers a broad product line of standard models, as well as engineering expertise to utilize our comprehensive design base to produce designs to meet each customer's specific requirements. Unlike lower cost "commercial" air or gas dryers, Kahn units are conservatively designed, heavy duty systems which will require minimal maintenance and provide maximum reliability. Most 25 or 30 year old Kahn dryers are still providing round-the-clock service in process-critical applications, and Kahn routinely supports older equipment still in service around the world. In further evidence of Kahn's outstanding reputation for high reliability, every commercial nuclear power plant in the U.S. uses Kahn air dryers for various air systems, including the emergency backup start systems. In contrast with firms that offer only a standard product line, Kahn specializes in providing the right dryer system for each application. Every customer's requirement is different, and Kahn has 50 years of previous designs to quickly call upon to provide optimized performance. If further customization is needed, Kahn has an extensive engineering staff and test facilities. This breadth of experience and capabilities has led Kahn to the forefront of adsorptive systems technology and made us a leader in the commercial and military dryer world. Kahn low and high pressure (up to 5,000 psig) air dryers are in service on most U.S. Navy ship classes in service, including both surface ships and submarines. Kahn low pressure condenser-filter air dehydrators are currently in service on the DDG 51 Arleigh Burke-class guided missile destroyers. Kahn MPS series instrument air dryers are being installed on the three latest ARCO supertankers. We can bring the same level of technology to your application.